You step calmly onto your deck, with your morning coffee in hand and just yards from your door, a light fog hovers over a tree-lined lake. A loon calls hauntingly across the water. Welcome to Lake ‘N Pines Lodge. Days at the Lake ‘N Pines Lodge always start out wonderfully. Guests order from the breakfast menu the night before and can choose from amazing homemade omelets, french toast, eggs benedict, and more. Guests can have breakfast delivered right to their rooms at a time they designate, for no charge! What a surprising perk! 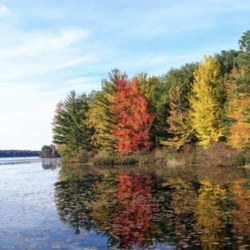 Lake ‘N Pines Lodge features three different suites, two with private entrances. 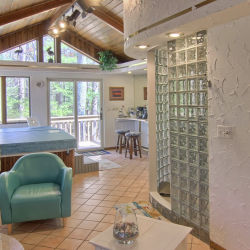 The Bay Chalet is a 900 square foot., one-bedroom suite with a two-person jacuzzi and hot tub, wet bar, cathedral ceiling with skylights, and other extras—perfect for a romantic escape. 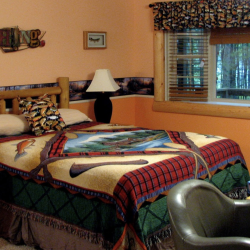 The Pines Nature Suite has two bedrooms, a full kitchen with all the essentials, plus a private deck. It sleeps four, making it ideal for a small family or friends’ getaway. The Angler’s Nook is another great option for a couple’s retreat. It boasts a full kitchen, queen bed, electric fireplace, a private deck with a grill, and a bay window for viewing nature in all its splendor.